The Office 365 wave has hit organizations of all sizes and functions across the globe. It has made it easy and cost-effective to go into the cloud without giving up the familiar Microsoft server and client applications. The key to its success and widespread global adoption is its cost advantage and ability to improve the productivity of an increasingly mobile workforce. Though it has many advantages, Office 365 also brings forth additional challenges with user identity and access management. Be it bulk user provisioning or license management, many administrators question whether Microsoft's native tools and PowerShell scripts are the best approach. Managing users in the cloud-based Office 365 or the on-premises Active Directory (AD) often results in unnecessary confusion, repetition, and delays. In addition to user provisioning, Office 365 license management is a tedious activity for administrators. So if you are looking for a solution that offers the operational agility and capability to automate Office 365 management, ADManager Plus is the solution for you. 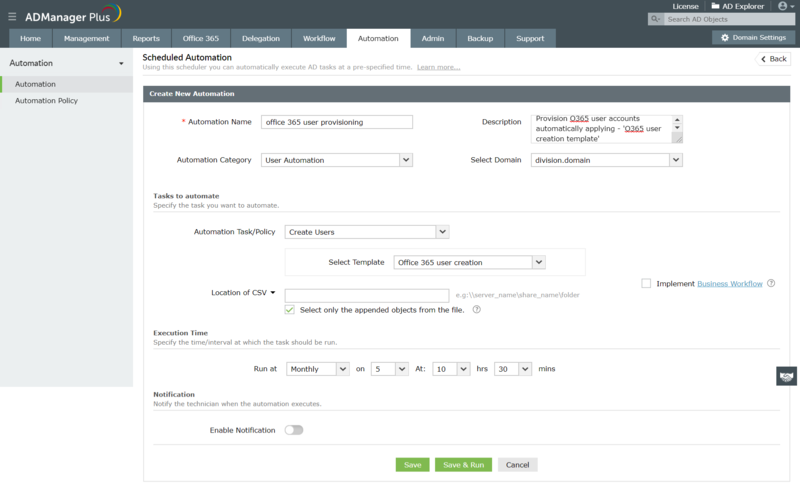 Administrators can automate the Office 365 user provisioning process in just a few clicks by applying the customizable user provisioning template in ADManager Plus. While creating a template, users can choose whether or not to enable 'DirSync' for the user accounts. The ability to preconfigure user attributes and facilitate trouble-free automation is a unique advantage specific to ADManager Plus. And it doesn't stop there; you can also automate other administrative tasks such as disabling, enabling, and deleting Office 365 users. Fig. 1 is a snapshot of the user provisioning task under the automation tab. Every time a new employee joins the organization, the administrator is required to manually assign all the necessary Office 365 licenses. But with ADManager Plus, you can automatically assign product-specific licenses while carrying out automated user provisioning with custom templates. You can also automate the disabling or deletion of Office 365 user accounts if someone leaves the organization to free up the licenses for somebody else to use. Adding photos to user accounts enables easy identification in the AD and Office 365 environments. Further, when usernames are displayed with photos in global address lists (GALs), emails, and chats, the overall communication experience improves. Uploading photos in bulk for a group of users in Office 365 requires the administrator to write complicated PowerShell scripts. ADManager Plus's extensive automation features and UI-based actions make it the best alternative to eliminate user photo management issues. Be it automation of a bulk upload or the replacement of Office 365 user photos, enjoy the flexibilty of selecting users from a list of preconfigured reports or a CSV file. Using ADManager Plus, you can specify whether the user accounts created in Office 365 need to be synchronized with the on-premises AD environment (DirSync-enabled), depending on your organizational policies. So, for all DirSync-enabled user accounts, automating photo management in AD means parallel automated updating of photos in their corresponding Office 365 profiles. Fig. 2 is a snapshot of the automation tab for management of Office 365 user photos. With the native tools, automating report generation is almost impossible. And other options, such as PowerShell, make it extremely difficult to automate report generation. ADManager Plus' Scheduled Reports give IT administrators access to a wide array of reports that can be scheduled for automated generation at intervals chosen by you. You can have them delivered to a specified email as often as you like--hourly, daily, weekly or monthly--in PDF, CSV, HTML, XLS, or CSVDE formats. You can automate generation of Office 365 User reports, Office 365 License Reports, and Office 365 Group Reports. Fig. 3 is a snapshot of the Scheduled Reports for Office 365. 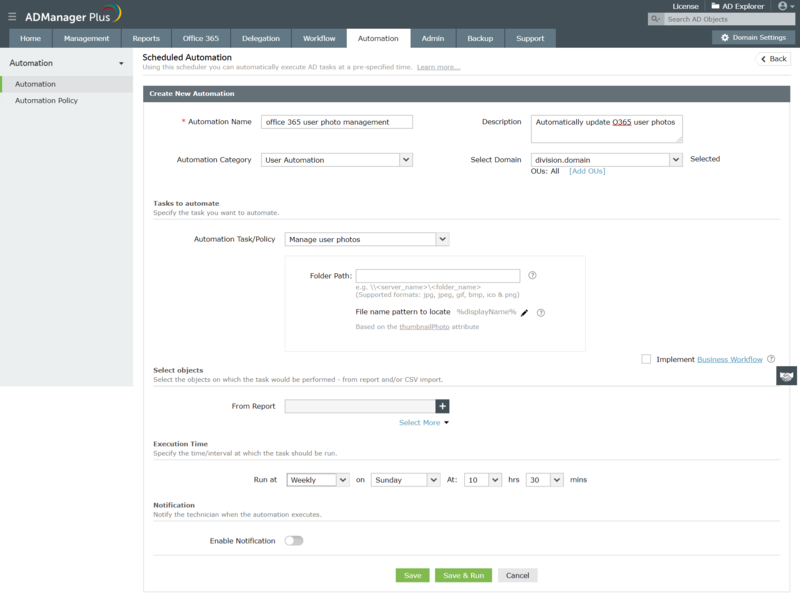 ADManager Plus has a lot more to offer under Automation, including 14 crucial AD tasks that can be automated by choosing from 100 prebuilt actions for user creation, user modification, group modification, computer, and contact management.